Kingdom Come is the romantic thriller novel about a former spy who hunts for his nemesis, a dangerous bomber known only as The Woodpecker. Set against the backdrop of Kashmir, Ladakh and Tibet, this novel tells the story of Krivi Iyer, a former spy and bomb defusal expert who has an unsettled score with an unstable bomber known as The Woodpecker. In his mad vendetta against the bomber, he finds a trail which leads to Ziya Maarten, the manager of ‘Goonj Business Enterprises’ in Srinagar, Kashmir. Ziya is alleged to be the Woodpecker’s sister. With her, Krivi thinks he can find his nemesis and settle the score. However, Ziya is not the terrorist’s sister, but a beautiful distraction, one that Krivi finds himself infinitely enthralled by. Ziya discovers Krivi’s past, and the two must decide whether the darkness of the past is enough to keep them away from each other, especially when Ziya herself hides a thirst for vengeance that scars her heart. A man with checkered past, but on a mission. A girl embroiled into the life threatening situation just because of a single element of her childhood. And a lunatic, bomb-obsessed terrorist. Then of course there were the agents, the police force and the army. What more does one want from a thriller? Add sensuous chemistry between the well etched characters and you have an entertainer in your hand. Krivi’s shaded past, Ziya’s orphanage upbringing and Woodpecker’s back story have been entwined expertly into the narration keeping the readers on the edge of their seats. After reading every twist I felt what more, but Aarti manages to spring surprise after surprise keeping me absorbed throughout. Aarti V Raman has not only successfully carved the characters of the hero, the heroine, and the villain, but has also brought out the supporting characters alive; be it Noor, Sam, Dada Akhtar or Krivi’s ex-boss. Another aspect, I marvelled at, was the well researched and equally well written; bomb diffusing, combat, surveillance scenarios. The terrorist was feared by the whole world and I feared for Ziya’s life when she was caught. Superb. The vivid descriptions of beauty of Kashmir, Ladakh and Tibet made the story a joy to read. Aarti’s attention to detail is evident throughout the book. Expressively written by Aarti V Raman, the full length novel is a excellent spy-story with sizzling not one but two romance plots. If one (like me) wants to read a fast paced, page flipping story then Kingdom Come is the one for them. 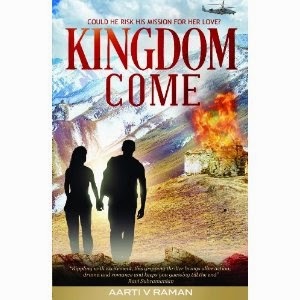 Aarti V. Raman is an Indian fiction writer and novelist of historical and contemporary romance. A student of Journalism at the Mumbai University and Creative Writing at Deakin, she considers herself a student of life. Other books to her credit are: ‘White Knight’, and upcoming historical series ‘The Lords of Devil Manor’.